A. J. Wanderlust departs at 8:56 am to find no wind and flat seas. On a quiet morning, I rhumbline to Kingston in bright sunshine. A. J. Wanderlust is on the fuel dock by 10:20 am, and Denny pours 22 gallons fuel into her tank as I walk Jackson. By 11:44 am, we are in Puget Sound with Double Bluff to starboard and Point No Point ahead to port. By 1 pm, A. J. Wanderlust is nearly to Admiralty Inlet. Pale blue skies open expansively overhead and by afternoon A. J. Wanderlust has wind on her nose from the northwest at 10 knots. Under motor, she speeds along at between 6 to 7.4 knots. Tide rips swirl and rage off Marrowstone Point and A. J. Wanderlust�s speeds drop from 5.2 to 3.5 knots, soon, she is clawing her way forward at only 2.1 knots. It is a slow and painful few hours from 1 pm until 3:43 pm. I angle A. J. Wanderlust one way and then another, looking to gain some advantage against the painfully slow adverse tide pushing the hull backward at 4.5 knots. Denny and Jackson are sleeping and I feel my eyes grow heavy as I sit behind the helm of A. J. Wanderlust. The northwest wind turns to a westerly at 10 knots and I look to the sky as the cloud cover increases ominously near Port Townsend. By 4:34 pm, A. J. Wanderlust still can only achieve 4.9 knots and I throttle forward to increase the RPMs fearing dark. Shooting across the traffic separation zone in my attempt to rhumbline to Victoria, I note that I have left the yellow SA racon buoy to the wrong side. My eyes keep a careful watch to the horizon as I am traveling in opposition to traffic; traffic that could be traveling in excess of 25 knots and have limited ability to avoid a small sailboat. I continue to race daylight in the Strait of Juan de Fuca and can feel the building 1.5 foot ocean swell. Westerly wind at 10 to 14 knots blows on A. J. Wanderlust�s bow. Heavy clouds hang low overhead, but there is surprisingly little traffic on this cold day. By 7 pm, A. J. Wanderlust has regained some of her forward progress against the tide and motors forward at 6.3 knots. Trial Island lighthouse is sighted just to starboard of the bow. Progress is steady now and by 8:52 pm, A. J. Wanderlust is situated just off the red and green flashing breakwater lights. I record a logbook time of 9:23 pm, after steering A. J. Wanderlust onto the Customs dock. Victoria Harbor offers good protection and only a light wind can be felt on my face as the Canadian courtesy and yellow quarantine flag sway gently in the breeze. Efficient and polite, A. J. Wanderlust and her crew complete Customs formalities and arrive to the dock in front of the Empress Hotel by 9:50 pm. Jackson does not understand the concept of evening cocktails and Denny does not understand the urgency of a walk. In a compromise, I fill large coffee cups with secure lids full of rum and coke. Exiting, we note a coded gate and I run back to another pleasure boat moored by to request the code as Denny and Jackson venture forth. My first impressions of Victoria are favorable. The Parliament building is outlined in white lights and makes a picturesque image on the harbor shore. 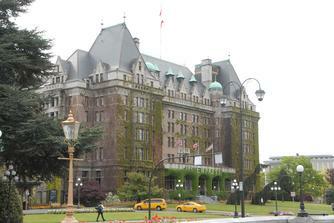 The Empress Hotel has spot lighting which highlights is old brick fa�ade overgrown with tangled ivy. The morning of May 11th is overcast, but my spirit is high as Denny and I sit in the cockpit enjoying coffee and hot chocolate respectively. 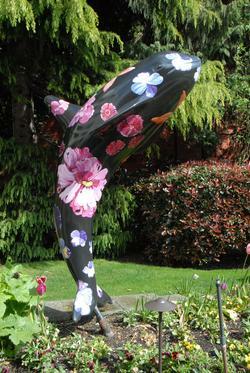 The locked gate is opened about 9 am and a few tourists walk the floats. They ask about the boat and especially inquire as to her Davison, Michigan hailing port. As soon as the large Bernese is spotted sunbathing on the bow, he becomes the subject of conversation. Caffeine requirements fulfilled, Denny, Jackson and I head off for a walk. 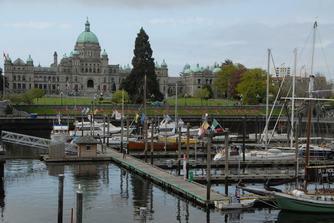 The streets of Victoria are picturesque with many of the buildings being more than a hundred years old. It is an odd contrast, seeing these ancient buildings stuffed full with modern day souvenirs and memorabilia. 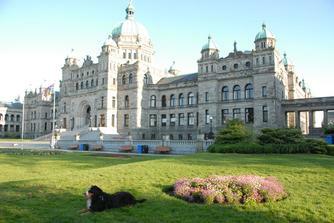 Jackson most enjoys the lavish green grasses surrounding the Empress Hotel and Parliament Building, sufficient for a Bernese to roll in. 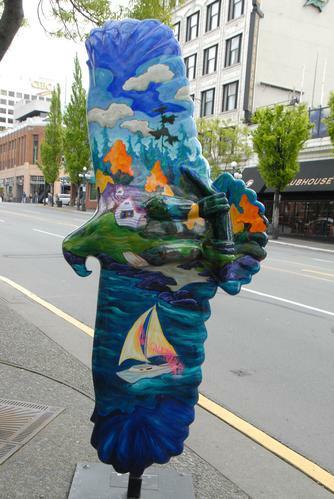 From atop the harbor, we view the bright pink flowers which spell out �Victoria.� Strolling through town and in various locales, we find the large ceramic whale sculptures, all differently decorated to a particular artist�s rendering. Having exhausted Jackson, we return him to A. J. Wanderlust and venture forth for more human explorations. 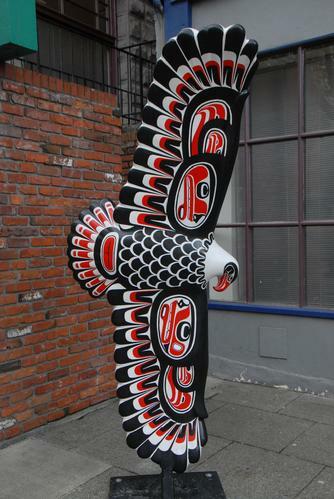 Denny has been to Victoria before and his favorite spot for lunch is Garrick�s Head Pub. The casual atmosphere, good food and cold beer are wonderful. The interior d�cor is eclectic. 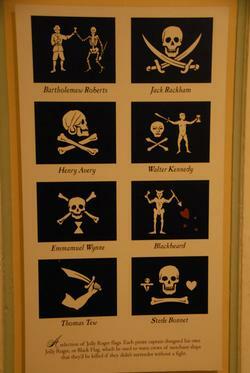 A long afternoon is spent at the Victoria Maritime Museum with its many fascinating exhibits. I have a consulting job lined up for next month in New York and so our schedule in Victoria is tragically hurried. Awaking the morning of May 12th, I wish that A. J. Wanderlust could linger on the dock here a few days. I like the feel of Victoria, the pace. Jackson seems to enjoy the city to walk in, and so Denny and I delay as long as we dare, enjoying a long morning walk and lunch at the Irish Pub. With the clock showing 4:43 pm, it is clear we cannot delay further. We release the dock lines of A. J. Wanderlust and head off enroute to Friday harbor. Exiting the harbor breakwater, we are pleased to find west-southwest winds of 15 knots. We hoist the sails of A. J. Wanderlust and reef for a comfortable downwind wing on wing. Seas are 2 to 3 feet. A. J. Wanderlust gallops forth, attaining incredible speeds of 7.7 to 9.4 knots. I am exhilarated when we can even sail A. J. Wanderlust through Cattle Pass at almost 8 pm. By 8:50 pm, I am mooring A. J. Wanderlust onto the Customs dock in Friday Harbor. Jackson happily trots alongside me to Customs, expecting the usual cookie treat. Evidencing his delight, I do not mind having to personally present myself to pay for A. J. Wanderlust�s 2009 decal. We dinghy ashore with coffee the morning of May 13th, A. J. Wanderlust has to travel about 60 miles today, a full day�s travel for a sailboat, and we need to depart Friday Harbor as early as possible. The dinghy is secured to the foredeck and we hoist anchor at 9:58 am, motoring out into San Juan Channel in southeast winds of 10 to 15 knots. The sky is grey and overcast. Pleased to have wind, Denny and I hoist sail and A. J. Wanderlust sails a beat through Griffin Bay to Cattle Pass. Our speeds average 5.3 knots. We know from consulting the tide and current predictions that we will have a favorable push this afternoon. By quarter to noon, A. J. Wanderlust�s movement is brash as she beats into short, steep waves with wind acting against current. It is a lumpy ride in 2 to 3 foot seas. Two distinctly colored blue and yellow Alaskan tugs with fully loaded barges plow through the waters of the Strait of Juan de Fuca. By 12:40 pm, the wind has veered and now blows on A. J. Wanderlust�s nose at 15 knots from the southeast. I am saddened to give up the peace and quiet of sailing, but it is necessary to turn the engine on; even with the engine A. J. Wanderlust only achieves a speed of 4.5 knots. The day is chilly, with a cold wind and grey sky. By 3:30 pm, A. J. Wanderlust is confronted with strong headwinds from the southeast at 20 to 25 knots. But even the strong headwinds cannot suppress the momentum of the current, which speeds A. J. Wanderlust along at 7.6 knots. By 5 pm, the wind has decreased slightly to between 15 and 20 knots while a current continues to push the boat along in excess of 6.5 knots off Bush Point. By 6 pm, A. J. Wanderlust is located off Point No Point. With seas of only 1 foot, A. J. Wanderlust�s movement is calm and gentle. Overhead, the sun tries to break through thick cloud cover. I must add additional fleece layers at a quarter of 8 pm; the air is getting very cold now. A. J. Wanderlust proceeds at a steady 5.7 knots until the Meadow Point buoy. We are home; we have arrived to Shilshole Bay Marina. A. J. Wanderlust is on the dock at 9 pm. Over an evening cocktail, Denny compliments me on my stellar docking job.